For decades, as a critic for the now-defunct Tucson Citizen daily newspaper, I covered Arizona Opera Company’s productions, season after season. I saw the classics of the operatic world and the minor delights of the standard repertoire as well. Yet despite displays of virtuosity and passion, never was I so moved by a single work as I found myself seeing this first mariachi opera. At numerous points I found tears streaming down my face. The music was lush and lyrical, sophisticated and simple, all to dramatic effect. The staging was dirt simple, the story line hopscotching through time like the old man’s memories it portrayed. But like all truly great opera, simple musical themes found their way back like waves of memory, bringing the audience along on an emotional but beautiful ride. The story line centers around the U.S. / Mexico border and a man with dreams of a better life for his family who leaves his home in Mexico to labor in Arizona. Seven years later, his wife has a grand house for herself and her young son, but rarely sees the husband who sends money home. Being a complete family again means more to her than her fine home. So in secret, the pregnant wife hires a coyote to smuggle her and her son across the border to reunite with her husband. But like many who try to beat the desert, the harsh terrain wins. She dies in the desert, her body left behind as the coyote returns the boy to his grandparents in Mexico. The grandparents blame the husband and deprive him of a life with his son. He remarries in the United States and has another son. And while he returns to Mexico when his first son is a grown man, he is rejected by his Mexican offspring. In the final days of his life he is left contemplating his first wife, his lost son, and the monarch butterflies that seem to cross the border and return so easily. But as the song reminds, it takes generations for them to do so. In the end, his American granddaughter convinces the Mexican son to come to his bedside, and he dies in peace, surrounded by his sons and two granddaughters. There have been many modern works that have taken topical subject matter of the day, from John Adams’ “Nixon in China” and “The Death of Klinghoffer,” to Anthony Davis’ “Tania” (the Patty Hearst story), Jon Moran’s “The Manson Family” and more. Opera lends itself well to putting a human face on such complex narratives. 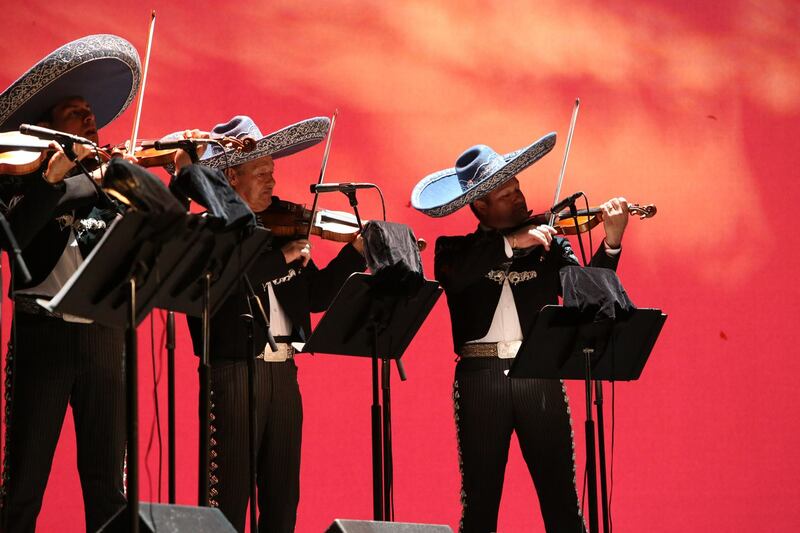 But a mariachi opera is both an unlikely twist and a paradoxically logical one. The mariachi is a mini opera company of sorts, with virtuoso instrumentalists, a stable of vocal soloists of myriad timbres, and a chorus of power and strength. The vocal style is rooted in the Italian Bel Canto operatic tradition. Moreover the modern “show” mariachi, of which Mariachi Vargas, which supported the singers last night, is considered the zenith, is an ensembles of precision, sophistication and nuance to rival the best in the classical world. And in fact, the mariachi has long been in the story business from the corridos (ballads) of Mexican tradition to the film classics of Pedro Infante, Lola Beltrán, Miguel Aceves Mejía and others from the heyday of Mexican Cinema. Still, a large scale single story line of this sort is something entirely new within the genre, akin to The Who’s “Tommy” for its groundbreaking merging of large form story telling and truth to its own genre. Opera purists may quibble over the inclusion of spoken dialog in the work, but it seemed more natural to me than recitative. Both Haydn and Mozart wrote operas with spoken dialog, and contemporary American composer Robert Ashley composed entire operas without a single stretch of conventionally “sung” dialog. The “arias” of “Cruzar la Cara de la Luna” have more in common with the music of Pedro Infante and Jose Alfredo Jimenez than Caruso or Pavoratti. But along with its lyrical pieces, “Cruzar” presents a compendium of mariachi styles, from ranchera, waltzes and norteño flavors to works of smooth sophistication to rival Martinez’s predecessor as music director of Vargas, Ruben Fuentes. I suspect over time that these songs will find their way into the standard mariachi repertoire and be performed for generations to come, just as the songs from the golden age of Mexican cinema have. In the end, Martinez succeeds at telling a story he knows well in his own voice, and in doing so breathes something new and vital into the conventional operatic world. As an aside, I especially admired his brevity in telling the story. Having sat through six hours of Wagner’s Götterdämmerung – pure torture for a child of the short-attention-span TV age – I am down with the concept of a 90 minute opera. Leaving an opera wanting more might be a trend worth considering. The cast was outstanding, particularly Cecelia Duarte who played the first wife, Renata, Vanessa Cerda-Alonzo who sang the role of Renata’s friend, Lupita, and Octavio Moreno as the immigrant father. They and the supporting cast were as chiseled in their realization of their parts as the crisp accompaniment of Mariachi Vargas. Despite the simple staging, the scene of Renata dying attempting to cross the desert, her young son being scooped up and carried away from her dead body, was to me more moving than any Mimi’s death in any Bohème I saw in any performance anywhere in my 40-some years as an opera audience member. And it was wonderful to see such a diverse crowd in attendance as well. Never in all of my years covering the classical scene in Tucson have I seen an audience so representative of the community Arizona Opera serves. “Cruzar la Cara de la Luna” proves that it is possible to create a modern, provocative, thoroughly tuneful operatic experience that will move an audience to its core. That is something worth celebrating. I applaud Arizona Opera for bringing this important work to the Tucson and Phoenix stages, and I look forward to seeing what surprises AOC director Ryan Taylor has up his sleeve for the seasons ahead. ~ by Daniel Buckley on October 19, 2014.